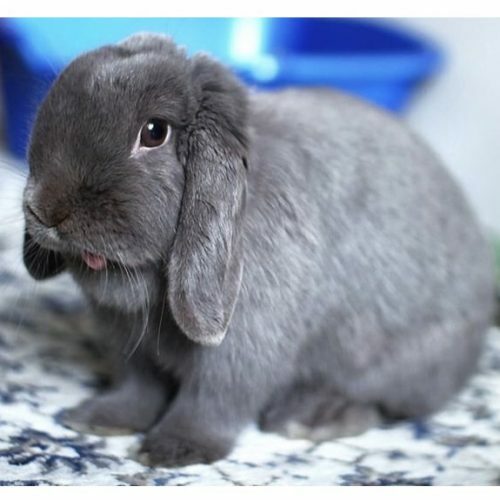 The happiest days at VRRA are when bunnies get adopted to their Forever Home. Here are a few examples of wonderful adoptions to celebrate. 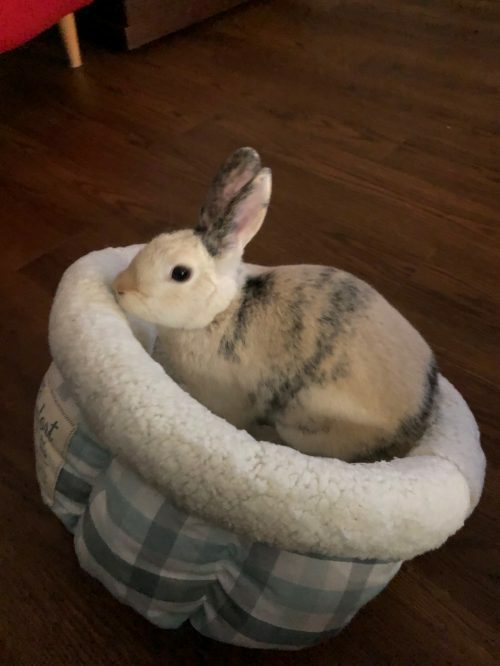 Sophie’s adoptive people say that Sophie feels like she owns their apartment now 🙂 House Rabbits are always happiest when they rule the roost! We’re so happy that Polo has found a home that appreciates his active and personable nature. 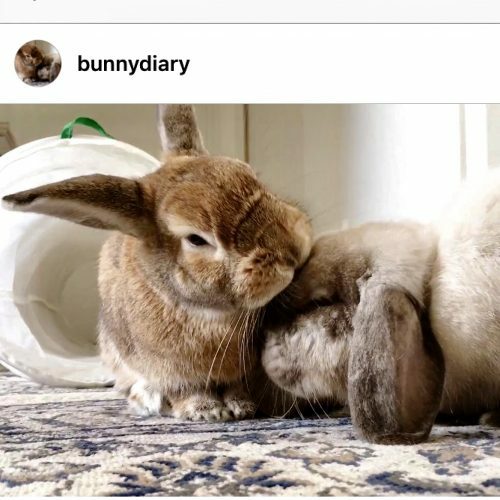 Life is so much better with a bunny! 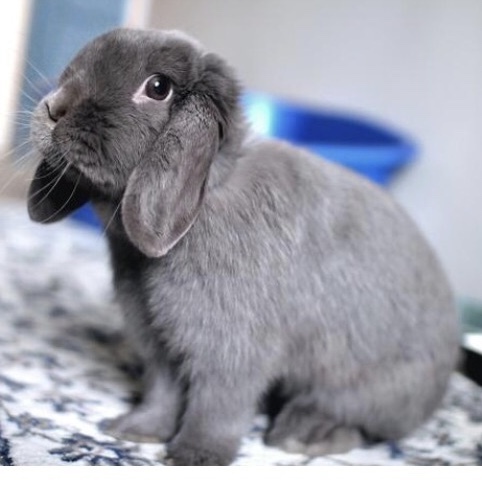 Louie is a lucky rabbit in that he went straight from one of our foster homes into his Forever Adopted Home. 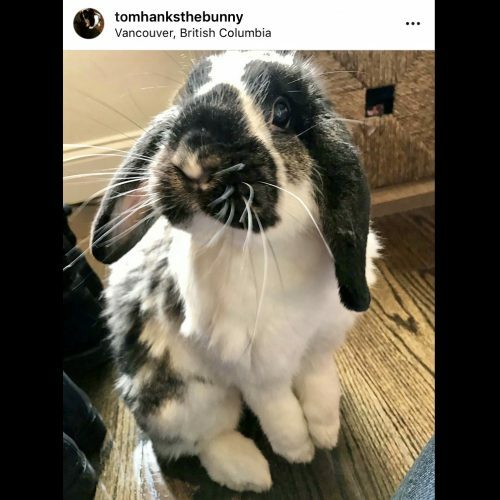 Check out this video of him having some hoppy snow fun! 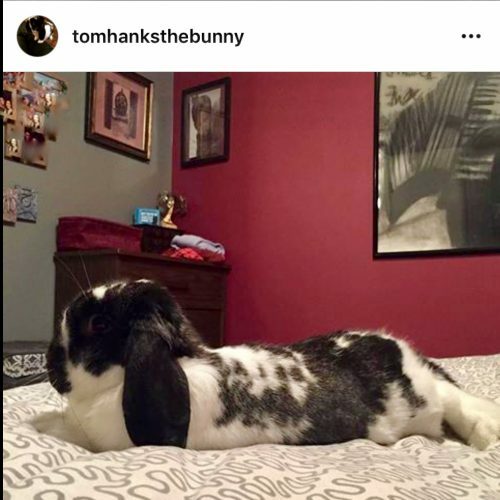 We’re so happy to see you enjoying life and being loved Louie! This is what we wish for all of our rabbits. 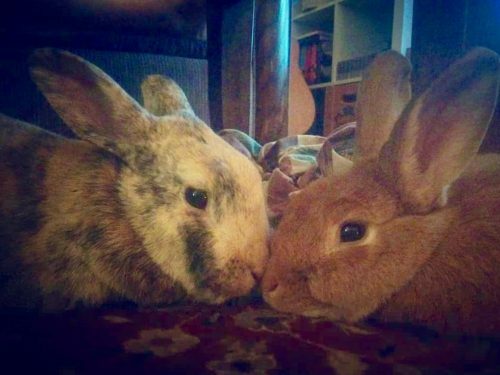 Here’s another adorable pair, both adopted from VRRA but at different times, and finding true bunny love companionship together. 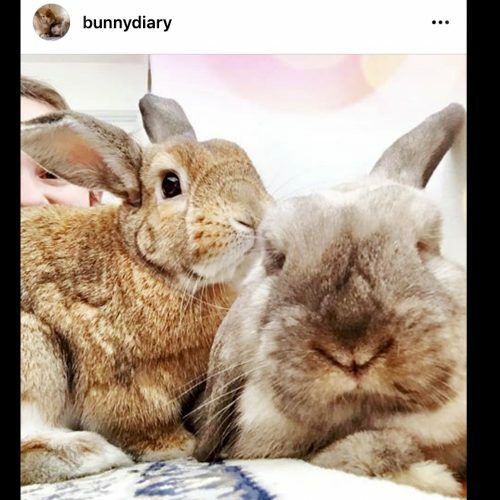 You can follow their story on Instagram @bunnydiary and they also have a YouTube page – check out their funny house bunny antics here. Here’s our lovely Baboo (formally known as Eve) in her happy adoptive home, celebrating her first Birthday! We’re so happy for you Baboo xoxo. Check out how happy Disco is! She was lucky not to have to spend too long at the shelter prior to her Forever Family taking her home. 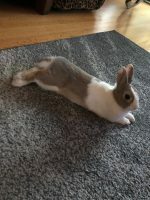 They report that her favourite toy is Nutrinom’s Pineapple Exress, and her favourite activity is enjoying conversations with her people while sitting on their laps. That’s an awesome Happy Tail! 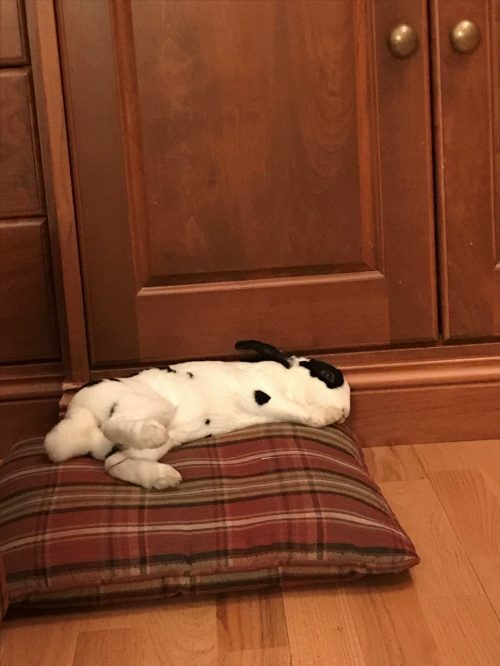 Griffin’s family says, “We weren’t sure if Griffin would cheer up when we brought him home from the shelter, but he is such a different rabbit now! 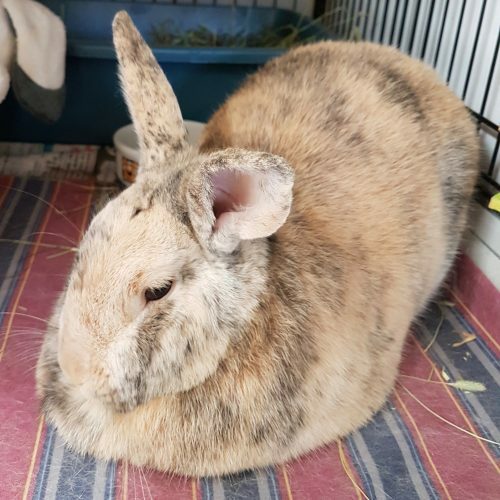 He’s quite the bunzilla and keeps himself busy moving stuff around, and always rushes over for cuddles.” We’re so happy for you Griffin! Sad Griffin at the shelter. Happy Griffin in his new home with his BFF, Cindy. 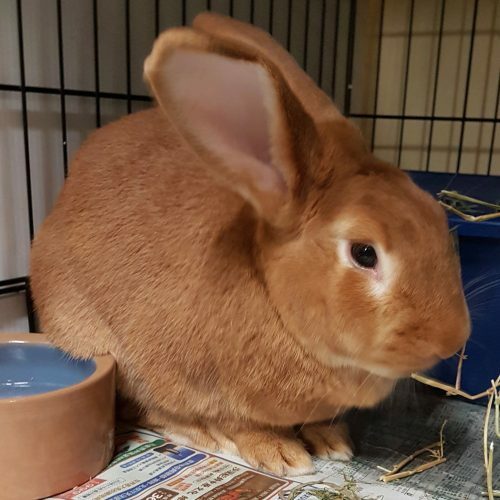 Clifford is a big bunny and luckily wasn’t at the shelter long before finding his perfect adoptive home. 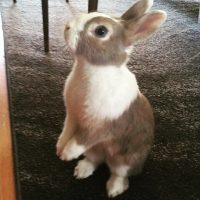 He greets his humans with a binky-bunny dance when they come home from work. Way to go Clifford! 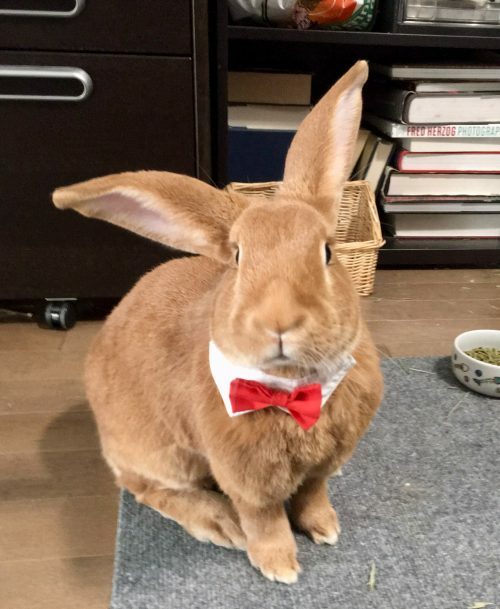 Clifford dressed up on adoption day (click for video).